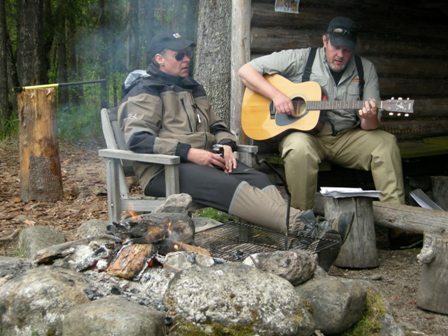 Fly Fishers who know how to enjoy their fishing! It has rained and rained and rained the last few days, but today there is no wind; yellow-may-duns whirl past, caddis pop up, stone flies struggle to fly. If you stand quietly next to the river and wait a few minutes, you will see burgundy colored splashes here and there. If you don’t see them, you can hear them. The river is waking up from a long winter’s nap.